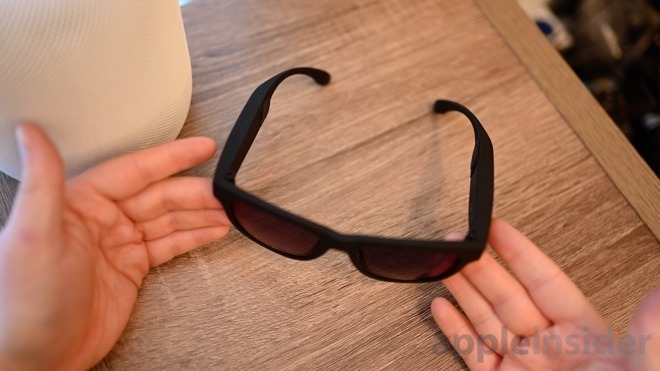 In a nutshell, the Lucyd Loud is a pair of "smart" glasses that integrate bone conduction speakers to let you take phone calls, listen to music, and chat with your phone's assistant, all while keeping your ears uncovered. This is certainly an enticing proposition, one we were eager to try out. In choosing your pair of Lucyd Louds, you can go with the basic set without any prescription or tinting. The laundry list of add-ons include prescription lenses, sunglasses tinting, polarization, or even blue-light blocking for long gaming sessions. Each of these modifications adds a bit to the price, but still much lower than a lot of traditional glasses shops. To get a better idea of how the glasses will look, Lucyd offers a very cool live AR preview within the site using your device's camera. Only downside, you can't see them with different lenses, so you can only check out the frames. Our initial vision was for the Lucyd Louds as our go-to device when taking the pups for a walk outdoors where we could make phone calls or listen to music, but still being aware of the surroundings. For our tester, we chose the tinted lenses which include polarization. In only two days, we had our pair in-hand to try out. Packed in a bright purple and white box, was our pair of glasses. Aside from the glasses, we got a pair of earplugs, a charging cable, and a very nice foldable carrying case. The folding case was surprisingly solid, feeling very secure when tossing in our bag, but folding completely flat when unneeded. We plugged the Lucyd Loud glasses in via the micro USB port -- yes, frustratingly still micro USB -- and made sure they were fully charged. With a capable enough charger, it should only take two hours to charge from zero to 100. Lucyd included a pretty shoddy micro USB cable, especially when it comes to length. We preferred to use our own. For a traditional pair of glasses, there are a number of things to look at -- the quality of the lenses, the overall fit, the design, and the build quality of the frames. When you take that and make it a pair of smart glasses, now we have even more to evaluate. Starting with the basics, the lenses that we got with the polarized tint, was sufficient but not the best. Examining under light, the tinting is uniform and does a decent job of blocking the bright sun. It isn't an extremely strong tint, letting us wear them inside a bit without too much of an issue -- other than looking slightly odd. We can't vouch for the validity of their prescription lenses, but these basic sunglasses seemed on par with any other $50 to $100 pair. The exterior of the frames has a matte, soft-touch finish to them. This is a more subtle look and not too flashy, though the lenses and sides are a bit on the large size. In fact, the glasses as a whole are a bit large, but not bulky. All of the tech inside the Lucyd Loud is within the two arms, before the ears. These parts are a bit tall, and a bit thick though they don't come off that way while wearing them. If someone knew they had speakers and Bluetooth built in, it'd be obvious, but otherwise, most people won't bat an eye at what otherwise might be a questionable fashion choice. 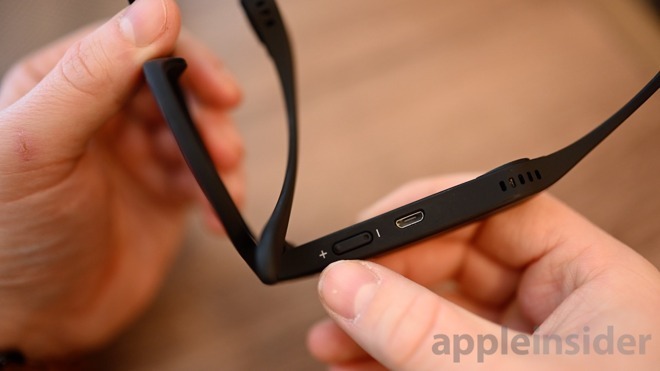 Each side of the glasses has a covered bone-conductor speaker that delivers audio through vibrations. On the right-hand side, there is a hidden pair of volume buttons and a micro USB port. 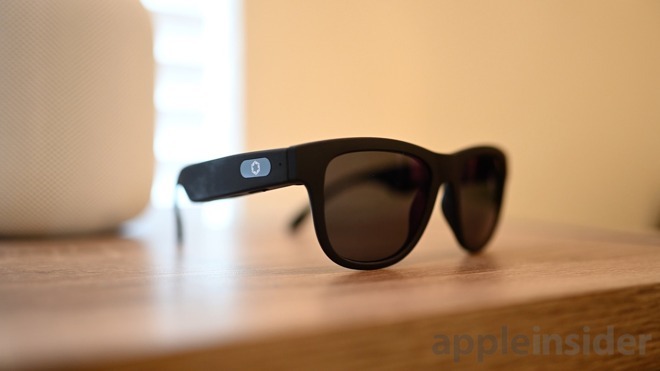 The left side has a touch-sensitive surface used to query Siri, control music, or answer calls. Lucyd Louds are meant to be comfortable and worn for long amounts of time. For us, they felt a bit on the snug side and gave us a slight headache after an hour-long walk. We wouldn't consider our head "large", so anyone that does should probably stay away. Since we were taking these with us, we paired them with our iPhone though nearly any Bluetooth device wil work just fine including your Mac, Apple Watch, or iPad. Musically, the Lucyd Louds had us wanting more. Audio wasn't that loud and at max volume, could be pretty easily heard by someone sitting next to you in quiet environments. Like we usually see with bone-conduction headphones, bass was pretty lacking. A quick listen to a few of the tracks in our headphone testing playlist, we were woefully underwhelmed. At max volume, the glasses also vibrated slightly, tickling our nose. Music controls worked really well and were responsive in changing tracks, along with playing/pausing. Siri also came up quickly and understood everything we said clearly. Even phone calls sounded adequate, but adequate is a low bar. The Lucyd Loud glasses are really fun to wear. It's pretty awesome being able to listen to music outside and hear what's going on. 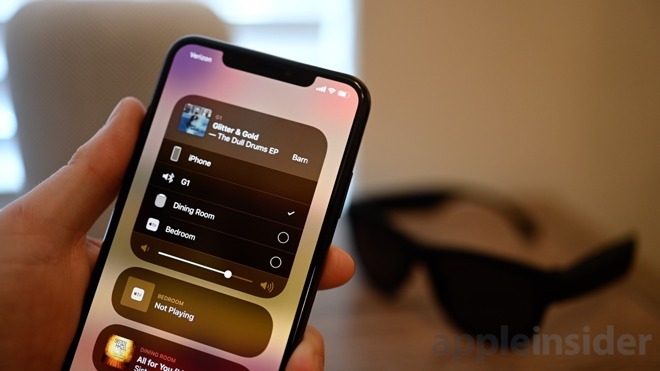 Phone calls are convenient too, not requiring you to bring headphones or put AirPods in. They aren't perfect by any means. Audio quality isn't amazing, they were a slightly too tight, and they rely on micro USB. However, for the current sale price of $50 plus any add-ons, they feel like a steal. Our only issue is that with the lenses non-replaceable, and they aren't usable in all situations. 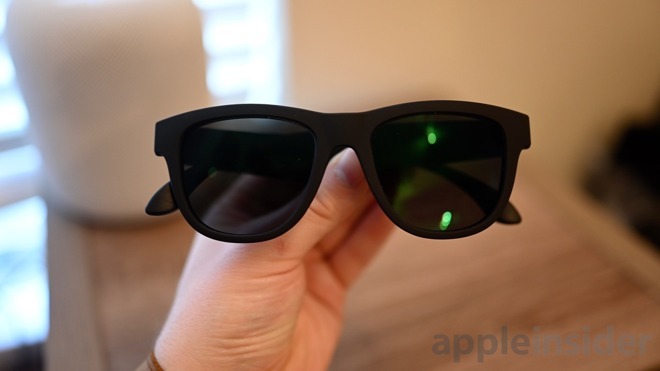 We can't wear them inside or on planes with the dark tint, but are less than useful in the sun otherwise. If there is a specific scenario you want to wear these, they are a great piece of tech to pick up, even if you still rely on real headphones and earbuds in most other situations. 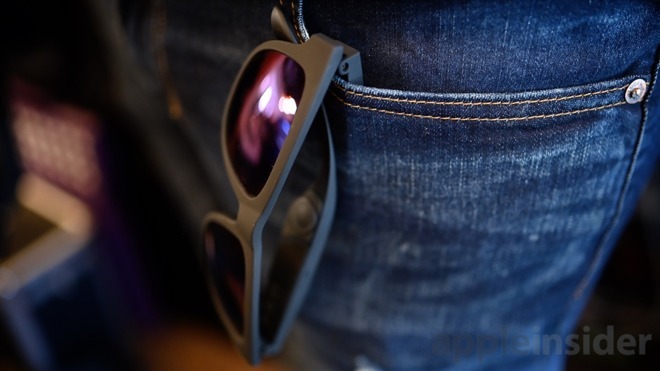 At the time of publication, the Lucyd Loud glasses are available 50-percent off for the holidays, only running $50. If you choose to add prescription lenses or other modifications, the price increases, but still fairly reasonable. I’m so glad that I can still get good reviews from Andrew on AppleInsider, the idiot that replaced you at iDB makes their videos unbearable. British comedian Eric Sykes used to wear what he called "Hearing Glasses" which he claimed were hearing aids built into the frames of his spectacles. The joke then being that he would wipe his eyes through the frames, showing there was no glass. A cheap gag that he brought out on chat shows in his later years, but it does kind of make sense since the speaker can work by resonating the auricle, or even bone conduction. I'm curious to try these, but i suspect they'll be a bit pricy. But if you partner them with AR glasses, like Google Glass was meant to be, or the proposed Apple project, could be very interesting. See, I got this friend named Lucyd Loud. I’m not going anywhere! Glad you followed me! Any neophyte audiophile knows that to get the best bass response from speakers, you have to ensure they're solidly coupled to the surface they rest on. In the case of them resting on rugs, there are spike feet available to make solid contact with the floor. So shave the hair around the ears like any 4.0 military haircut and install a little spike on either side of the speaker, on each temple. Solid coupling assured and an increased bass response of .003 dB. For reference, what size hat do you wear? I love music very much but not enough to own a pair of these. 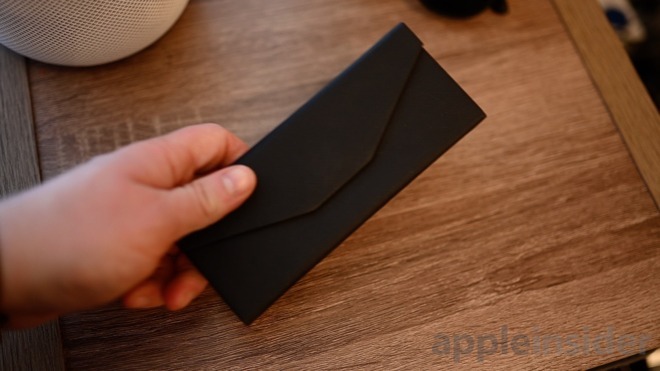 I like the folding case- similar to the ones Flexon has been including with frames for years. 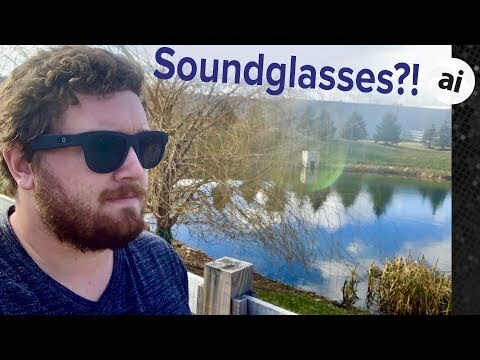 It seems that a pair of sunglass frames should have some level of water resistance. The frames themself look uncomfortable and chunky. It’s not really “Lucy-D,” it’s pronounced “lucid” but spelled with a Y. Still, maybe you’re right, the name does seem to be causing some confusion.